As our brain is made up of 100 billion of cells termed Neurons which are used to think and memorize things. Like as computer also have billions of tiny brain cells named Transistors. It is composed of chemical element extract from sand called Silicon. Transistors change the theory of electronics radically since it has been designed over half a century before by John Bardeen, Walter Brattain, and William Shockley. So, we will tell you how they work or what they actually are? These devices are made up of semiconductor material which is commonly used for amplification or switching purpose, it can also be used for the controlling flow of voltage and current. It is also used to amplify the input signals into the extent output signal. A transistor is usually a solid state electronic device which is made up of semiconducting materials. The electronic current circulation can be altered by the addition of electrons. This process brings voltage variations to affect proportionally many variations in output current, bringing amplification into existence. Not all but most of the electronic devices contain one or more types of transistors. Some of the transistors placed individually or else generally in integrated circuits which vary according to their state applications. What does a transistor made up of? Transistor consists of three layers of semiconductor, which have an ability to hold current. The electricity conducting material such as silicon and germanium has the ability to carry electricity between conductors and insulator which was enclosed by plastic wires. Semiconducting materials are treated by some chemical procedure called doping of the semiconductor. If silicon is doped with arsenic, phosphorous & antimony, it will obtain some extra charge carriers i.e., electrons, are known as N-type or negative semiconductor whereas if silicon is doped with another impurities like as boron, gallium, aluminum, it will obtain fewer charge carriers i.e., holes, are known as a P-type or positive semiconductor. • Base: It gives base to the transistor electrodes. • Emitter: Charge carriers emitted by this. • Collector: Charge carriers collected by this. If the transistor is NPN type, we need to apply a voltage of 0.7v to trigger it and as the voltage applied to base pin the transistor turns ON which is the forward biased condition and current start flowing through the collector to emitter (also called saturation region). When the transistor is in reversed biased condition or the base pin is grounded or having no voltage on it the transistor remain in OFF condition and not allow the current flow from collector to emitter(also called cut-off region). If the transistor is PNP type, it’s normally in ON state but not to be said perfectly on till the base pin gets perfectly grounded. After grounding base pin the transistor will be in reverse biased condition or said to be turned ON. As the supply provided to the base pin it stops conducting current from collector to emitter and the transistor said to be in OFF state or forward biased condition. A Bipolar junction transistor is made up of doped semiconductor with three terminals i.e., base, emitter & collector. In this procedure, holes and electrons both are involved. A large amount of current passing into collector to emitter switches up by modifying small current from base to emitter terminals. These are also called as current controlled devices. NPN and PNP are two prime parts of BJTs as we discussed earlier. BJT turned on by giving input to base because it has lowest impedance for all transistors. Amplification is also highest for all transistors. In the NPN transistor middle region i.e., base is of p-type and the two outer regions i.e., emitter and collector are of n-type. In forward active mode, the NPN transistor is biased. By dc source Vbb, the base to emitter junction will be forward biased. Therefore, at this junction depletion region will be reduced. The collector to base junction is reverse biased, collector to base junction depletion region will be increased. The majority charge carriers are electrons for n-type emitter. The base emitter junction is forward biased so electrons move towards base region. Therefore, this causes the emitter current Ie. The base region is thin and lightly doped by holes, electron–holes combination formed and some electrons remain in base region. This causes very small base current Ib. The base collector junction is reversed biased to holes in the base region and electrons in the collector region but it is forward biased to electrons in base region. Remaining electrons of base region attracted by collector terminal cause collector current Ic. 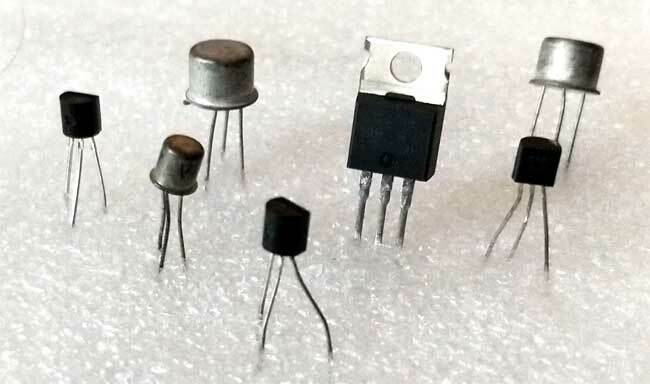 Check more about NPN Transistor here. In the PNP transistor middle region i.e., base is of n-type and the two outer regions i.e., collector and emitter are of p-type. As we discussed above in NPN transistor, it is also operating in active mode. The majority charge carriers are holes for p-type emitter. For these holes, the base emitter junction will be forward biased and moves towards base region. This causes the emitter current Ie. The base region is thin and lightly doped by electrons, electron–holes combination formed and some holes remain in base region. This causes very small base current Ib. The base collector junction is reversed biased to holes in base region and holes in collector region but it is forward biased to holes in base region. Remaining holes of base region attracted by collector terminal cause collector current Ic. Check more about PNP transistor here. Common Base (CB) Configuration: It has no current gain but has voltage gain. Common Collector (CC) Configuration: It has current gain but no voltage gain. Common Emitter (CE) Configuration: It has current gain and voltage gain both. In this circuit, base is placed common to both input and output. It has low input impedance (50-500 ohms). It has high output impedance (1-10 mega ohms).Voltages measured with respect to base terminals. So, input voltage and current will be Vbe & Ie and output voltage and current will be Vcb & Ic. Voltage gain will be high. Power gain will be average. In this circuit, the emitter is placed common to both input and output. The input signal is applied between base and emitter and the output signal is applied between collector and emitter. Vbb & Vcc are the voltages. It has high input impedance i.e., (500-5000 ohms). It has low output impedance i.e., (50-500 kilo ohms). Power gain is upto 37db. Output will be 180 degrees out of phase. In this circuit, collector is placed common to both input and output. This is also known as emitter follower. It has high input impedance (150-600 kilo ohms).It has low output impedance(100-1000 ohms). Current gain will be high(99). Voltage gain will be less than unity. Field Effect Transistor contains the three regions such as a source, a gate, a drain. They are termed as voltage controlled devices as they control the level of voltage. To control the electrical behavior, the externally applied electric field can be chosen that’s why called as field effect transistors. In this, current flows due to majority charge carriers i.e., electrons, hence also known as the uni-polar transistor. It has mainly high input impedance in mega ohms with low frequency conductivity between drain and source controlled by electric field. FETs are highly efficient, vigorous & lesser in cost. Field effect transistors are of two types i.e., Junction field effect transistors (JFET) and Metal oxide field effect transistors (MOSFET).The current passes between the two channels named as n-channel and p-channel. The junction field effect transistor has no PN junction but in place of high resistivity semiconductor materials, they form n& p type silicon channels for flow of majority charge carriers with two terminals either drain or a source terminal. In n-channel, flow of current is negative whereas in p-channel flow of current is positive. Apply small positive voltage to drain terminal where Vds is positive. Due to this applied voltage Vds, electrons flow from source to drain cause drain current Id. Channel between drain and source acts as resistance. Let n-channel be uniform. Different voltage levels set up by drain current Id and moves from source to drain. Voltages are highest at drain terminal and lowest at source terminal. Drain is reverse biased so depletion layer wider here. Depletion layer increases, channel width reduces. Vds increases at level where two depletion region touch, this condition known as pinch –off process & causes pinch off voltage Vp. Here, Id pinched –off drops to 0 MA & Id reaches at saturation level. Id with Vgs=0 known as drain source saturation current (Idss). Vds increased at Vp where current Id remains same & JFET acts as a constant current source. Apply negative Vgs and Vds varies. The width of depletion region increases, channel becomes narrow and resistance increases. Lesser drain current flows & reaches upto saturation level. Due to negative Vgs, saturation level decreases, Id decreases. Pinch –off voltage continuously drops. Therefore it is called voltage controlled device. Ohmic Region: Vgs=0, depletion layer small. Cut-Off Region: Also known as pinch off region, as channel resistance is maximum. Saturation or Active Region: Controlled by gate source voltage where drain source voltage is lesser. Breakdown Region: Voltage between drain and source is high cause breakdown in resistive channel. p-channel JFET operates same as n-channel JFET but some exceptions occurred i.e., Due to holes, channel current is positive &Biasing voltage polarity needs to be reversed. Metal Oxide Field Effect Transistor is also known as voltage controlled field effect transistor. Here, metal oxide gate electrons insulated electrically from n-channel & p-channel by thin layer of silicon dioxide termed as glass. The current between drain and source is directly proportional to input voltage. It is a three terminal device i.e., gate, drain & source. There are two types of MOSFET by functioning of channels i.e., p-channel MOSFET & n-channel MOSFET. There are two forms of metal oxide field effect transistor i.e., Depletion Type & Enhancement Type. Depletion Type: It requires Vgs i.e., gate-source voltage to switch off & depletion mode is equal to normally closed switch. Vgs=0, If Vgs is positive, electrons are more & if Vgs is negative, electrons are less. Enhancement Type: It requires Vgs i.e., gate source voltage to switch on & enhancement mode is equal to normally open switch. Here, the additional terminal is substrate used in grounding. By these equations, Ic decreases Vc, which reduces Ib, automatically Ic reducing. Here, (beta +1) factor will be less than one and the Ib leads to reduce amplifier gain. In this figure, it is the modified form over the collector feedback basing circuit. As it has additional circuit R1 which increases stability. Therefore, increase in base resistance leads to the variations in beta i.e., gain. In this figure, it is same as fixed bias circuit but it has an additional emitter resistor Re connected. Ic increases due to temperature, Ie also increases which again increases the voltage drop across Re. This results in reduction in Vc, reduces Ib which brings iC back to its normal value. Voltage gain reduces by presence of Re. In this figure, there are two supply voltages Vcc & Vee are equal but opposite in polarity.Here,Vee is forward biased to base emitter junction by Re & Vcc is reverse biased to collector base junction. Which gives a stable operating point. In this figure, it uses voltage divider form of resistor R1 & R2 to bias the transistor. The voltage forms at R2 will be base voltage as it forward biases the base-emitter junction. Here, I2= 10Ib. This is done to neglect voltage divider current and changes occur in value of beta. Ic resist the changes in both beta & Vbe which results in a stability factor of 1.In this, Ic increases by increase in temperature, Ie increases by increase in emitter voltage Ve which reduces the base voltage Vbe. This results in decrease base current ib and ic to its actual values. Transistors for the most of the parts are used in electronic application such as voltage and power amplifiers. Used as switches in many circuits. Used in making digital logic circuits i.e., AND, NOT etc. Transistors are inserted in everything i.e., stove tops to the computers. Used in the microprocessor as chips in which billions of transistors are integrated inside it. In earlier days, they are used in radios, telephone equipment’s, hearing head’s etc. Also, they are used earlier in vacuum tubes in big sizes. They are used in microphones to change sound signals into electrical signals as well. I'm teacher, I liked that.